The latest innovations in nitrile-based glove coatings have created a game-changing double-dip that takes the best of traditional palm coatings and rolls them into one unique glove treatment without sacrificing dexterity or tactile sensitivity. What's new in coated work gloves? For a long time, the answer to that question has been, not much! There have been many innovations in the work gloves themselves, including far higher cut levels and coreless technology that makes hand protection lighter and less irritating. But the coatings we use to increase grip as well as abrasion and liquid resistance have remained pretty consistent. Coated gloves are made by taking a machine-knit base glove and dipping it into the desired coating. Dipping ranges from a partial dip that covers the palm and fronts of the fingers, to a ¾ dip, to a fully dipped glove. Most coated gloves are single dipped, meaning they’re dipped only once. Some are double-dipped, meaning the glove is dipped, allowed to dry, and then dipped again to provide a thicker coating. For years, your choices in glove coatings have been polyurethane, nitrile, sandy nitrile, foam nitrile, or latex. And each of these comes with benefits and drawbacks. Benefits: The lightest, softest, and most flexible of the coating choices, polyurethane offers the best dexterity and tactile sensitivity—making it a popular choice for comfort and grip. Ideal for dry grip and ease of handling small parts, it's also good in lighter oil conditions. Drawbacks: This lighter coating tends to have less abrasion resistance than some others and can lose effective grip in heavy oil applications. Benefits: Nitrile creates a tough coating that provides excellent abrasion and puncture resistance that stands up well to oil. Drawbacks: A tough coating makes for less dexterity and tactile sensitivity, so it’s harder to do jobs that require handling small parts. Benefits: The sandy texture creates a non-slip grip that's good for heavy oils and liquids. Perfect for abrasion, puncture, cut, and snag resistance, this is a common choice for the oil and gas and heavy metal stamping industries. Drawbacks: Just like plain nitrile, sandy nitrile will cost you in dexterity and tactile sensitivity. Benefits: Nitrile foam absorbs liquid and draws oil and liquid away from the glove surface, making it easier to grip. This coating also has excellent abrasion, puncture, and snag resistance. Drawbacks: The foamy texture tends to become saturated in heavy oil or liquid applications. While traditional wisdom says that foam nitrile gives the best grip for oily jobs, it depends on the type of oil and what workers are handling. Other choices may be better, depending on the task. Benefits: Latex coatings provide the best overall dry grip of any coating. Drawbacks: Some workers are allergic to latex, and it tends to degrade when exposed to oils or hydrocarbon-based fluids, so it should be avoided for these applications. Benefits: Double-dipping a glove in any coating provides extra durability, liquid protection, and abrasion resistance. Drawbacks: Doubling the coating generally means significantly less dexterity and tactile sensitivity and an overall heavier glove. Manufacturers begin by dipping a machine-knit, cut-resistant glove into a nitrile coating. 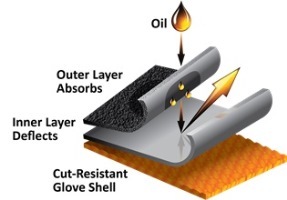 This creates an inner layer that repels oil to keep hands dry. They finish with a second dip to create another nitrile-based outer layer that actually absorbs oil yet allows minimal seepage, to provide a secure grip in the oiliest conditions. So unlike foam nitriles that tend to absorb oil all the way to the hand, workers remain comfortable and gloves don’t become saturated and heavy. Brenda Campbell, safety expert at Magid, gave sample gloves with the new palm coating to a major commercial HVAC equipment manufacturer. Their manufacturing process involves large copper tubes called hairpins that are stored in industrial-sized pans of oil. "Workers take the big copper hairpins out of the oil and put them into a machine," Campbell explained. "The oil just dissipates off the [new palm coating]. So even with the oil, they have great dexterity and grip." The tough coating also offers exceptional abrasion resistance that has tested at more than 50 percent better than foam nitrile and more than 60 percent better than sandy nitrile. As much as 30 percent lighter than other double-dips, gloves with this coating are extremely flexible and feel much like single-dip polyurethane coated gloves, so they're ideal for handling small parts, even in the slipperiest environments. Campbell said that in the past, the HVAC workers were double-gloving with a nitrile glove under a Kevlar string knit glove and changing two to three times a day due to oil saturation. The crew tried a polyurethane-coated glove, but it lasted only about an hour before the work chewed through the coating. As of our interview, Campbell reported workers were on day 21 and counting with their samples of the new gloves. Workers even have taken their gloves home and washed them because they didn't want to give them up. She added that assembly workers were able to pick up very small nuts and washers while wearing them. Campbell also recommended the new palm coating to a water heater manufacturer. High cut resistance and good grip in oil are essential to this job because workers have to hold and bend large metal sheets with sharp edges that are eventually joined together to make the outer metal covers of water heaters. With their old palm coating, workers were going through three pairs of gloves per day. The new palm coating gave them about three days of wear for each pair of gloves. Sarah Anderson, safety product expert at Magid, said that this new coating will be ideal for more than just jobs that involve heavy liquids or oils. "This new technology is also a good option for dry grip in highly abrasive environments," she said. "It creates a glove that's light but has higher abrasion resistance for any environment. Usually, to provide abrasion resistance and eliminate liquid penetration, you need a thicker coating. Now we're doing that with a lighter material. This is new in terms of the benefits it's going to deliver. This is something different!"